YAOUNDÉ, Cameroon, Feb. 19, 2014 — /CNW/ – Some of the most influential minds in physics and mathematics have joined the Chancellor of the University of Ottawa and previous Governor General of Canada Michaëlle Jean and Prime Minister Philémon Yang in Cameroon’s capital city, Yaoundé, to launch the a unique training program, teach the best and brightest students from across the continent and search for the next Einstein in Africa. The launch event featured a youth forum and speeches by Jean and Yang, and the scientists and a special youth forum. The event detailed how the African Institute for Mathematical Sciences – Next Einstein Initiative (AIMS-NEI) is progressing toward its goal with a new class at the AIMS centre of excellence based in Limbé on Cameroon’s Atlantic coast. It was held at the Palais des Congres in the nation’s capital. We are proud of what we’ve accomplished, AIMS has graduated 560 Africans with advanced degrees in mathematical sciences and more than a third have been women. Neil Turok, AIMS Founder & Director of the Perimeter Institute for Theoretical Physics in Canada. AIMS opened its fourth centre in Cameroon. It is the first institute in the Central Africa sub region and AIMS-Cameroon’s first class has 36 students from 15 African nations, 12 are women. The other centres are located in South Africa, Ghana and Senegal. A total of 45 Cameroonians had become alumni at the other centres prior to the opening. We are pleased to bring our concept to Cameroon. We bring together top global scholars in math and science to teach and research with Africa’s brightest students. Our graduates then use these skills to tackle the problems ranging from, disease and famine, to environmental degradation, illiteracy and poverty. AIMS graduates have a broad-based training and are talented problem solvers and innovators. Thierry Zomahoun, Executive Director of the AIMS Global Secretariat. The program is timely as economies in Africa have been experiencing phenomenal growth in the first decade of this century. Many countries had seen economic growth rates greater than 4 per cent and these high growth rates are predicted to continue until 2015. 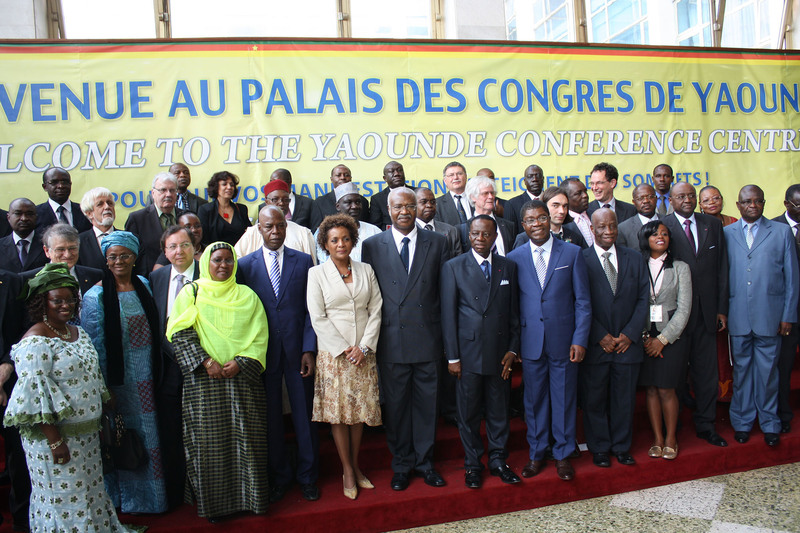 Cameroon has emerged as an economic leader in Central Africa’s region. Its economy at $27.9 billion (USD) grew 4.6 per cent in 2013 and is nearly a quarter (24.5%) of the total GDP of the region with $113.9 billion (USD). Cameroon’s economy is projected to grow by 4.9 per cent to $30.4 billion (USD) in 2014. As a result, the demand is exploding for a generation of youth that can apply science and math to ensure rapid and stable social and political development. Yet, only six per cent of post-secondary aged Africans are enrolled in apprenticeships, colleges or universities, compared to the global average of 26 per cent (UNESCO Institute of Statistics, Montreal, 2010). In Europe and North America the enrollment ratio is as high as 80 per cent. The AIMS-NEI is playing a major part in closing this gap in Africa, by opening centres of excellence for training, research and outreach. The plan is to create a network of 15 centres across Africa graduating thousands of mathematical sciences experts – half will be women – annually by the year 2023. “We are grateful for the support of the Government of Cameroon for the Next Einstein Initiative,” says Zomahoun. “This support confirms Cameroon is part of a growing group of African nations that want to raise Africa’s profile as a continent where science is ennobled and applied to solve global issues.” He also acknowledged the support from the Government of Canada, through the International Development Research Centre, and the Government of Germany. The government of Cameroon, through the Prime Minister, has expressed a keen interest in taking a lead role in research around quantum science and technology, and has requested that Cameroon be considered as the ideal location for such a centre in Africa. Why focus on mathematical sciences? Because mathematics underlies every modern technology from plumbing to electricity, smartphones to satellites. Its applications range from modelling and planning for economics, communications, transport, energy and health. Yet, it is also completely cross-cultural and free to share. Mathematical science is the foundation for development. Many AIMS graduates have gone on to leading positions in civil institutions and NGOs, as well as in universities, research centres and companies across Africa. The African Institute for Mathematical Sciences (AIMS) is a pan-African network of centers of excellence for post graduate education, research and outreach in mathematical sciences. Its mission is to enable Africa’s brightest students to flourish as independent thinkers, problem solvers and innovators capable of propelling Africa’s future scientific, educational and economic self-sufficiency. AIMS was founded in 2003 and has produced more than 560 graduates, about one third of whom are women. The goal of the Next Einstein Initiative is to build 15 centres of excellence across Africa by 2023. Follow us on Twitter and Facebook.